Viva Palestina, an organization that materially and morally supports the terrorist organization Hamas, launched its third convoy to Gaza last Sunday. Dubbed "The Return to Gaza," the convoy is an international effort, with groups joining from the UK, the U.S. and dozens of other countries. While some members of the Viva Palestina USA branch met their counterparts over the weekend in London, most will be joining the convoy in Istanbul on December 15th. The convoy plans to enter Gaza on December 27th after traveling through France, Italy, Greece, Turkey, Syria, Jordan and Egypt. It does so amid an ongoing British government inquiry and American-based requests for investigations to determine whether its support for Hamas has broken any laws. The brainchild of British MP George Galloway, the first Viva Palestina UK convoy publicly gave over $1 million to Hamas officials in March 2009. The second convoy, which departed New York in July with approximately 200 Americans, raised more than $1 million from fundraising events, largely through Galloway's speaking engagements around the country. The money was purportedly transferred to Egypt where supplies were purchased for distribution in Gaza. Due to a blockade imposed by Egypt, the group spent only 24 hours in Gaza, meeting with Hamas Prime Minister Ismail Haniyeh and visiting Hamas run-facilities, such as the Ministry of Prisoners, which is devoted to helping the families of Palestinian martyrs in Israeli jails. One of Viva Palestina's stated goals is to "distribute necessary medical aid to the Palestinian people." However, a closer look at the activities of the past two convoys indicates that the organization actually benefits Hamas more than individual Palestinians. "I did not witness the presentation of the ten truck-loads of medical aid that VIVA PALESTINA purchased in Cairo and was donated by Egyptian businesses. I was told by VIVA PALESTINA leaders that that aid was distributed to several NGOs. I wish that VIVA PALESTINA would report an inventory of the contents, of the trucks, and a list of the NGOs who received the aid." Perhaps in response to such doubts, as well as to complaints addressed to the federal government about its support for Hamas, Viva Palestina USA released a statement on its website on October 31st titled "Viva Palestina Addresses Concerns." It claimed that the organization "does not and in fact will not favour any political party within Palestine" and "the donations were given to a non-governmental consortium in Gaza called Expertise in Consulting and Development (CODE) which was, in turn, responsible for distributing the aid in a manner consistent with our goals, as well as with the community's needs." CODE receives significant funding, however, from the Union of the Good, designated by the U.S. Department of the Treasury in 2008 as an organization created by Hamas to "transfer funds to the terrorist organization." The Treasury press release notes, "In addition to providing cover for Hamas financial transfers, some of the funds transferred by the Union of Good have compensated Hamas terrorists by providing payments to the families of suicide bombers." "Maybe the American government, the British and the Israelis don't recognize Ismail Haniyeh as Prime Minister of Palestine, but we recognize Ismail Haniyeh as Prime Minister of Palestine." "It's not about charity... but in every way that we cut it, it is political." "[I]n choosing Hamas, what they chose was one united Palestinian state on all of the 1948 territories from the north to the very south. That is what Palestinians chose. And in supporting Palestinian choice we are saying we support their right to liberation from violent colonialism." In addition, most U.S. events focused more on garnering support for the upcoming convoy and on the plight of Palestinians rather than on fundraising. "Please takes steps to confirm whether IFCO has (or has not) acted as fundraising conduit for Viva Palestina. If so, IFCO's status as a 501(c)(3) entity must be revoked. The taxpayers of the United States should not and cannot support the activities of recognized terror organizations. [Emphasis original]." Most donations for the third convoy were raised through events in the UK. 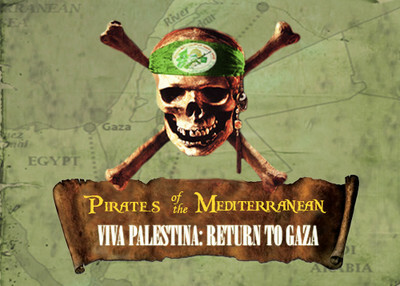 Viva Palestina officially partnered with the radical anti-Israel British based group, the Palestine Solidarity Campaign (PSC), whose stated mission includes campaigning for "the right of return of the Palestinian people," and opposing "racism, including anti-Jewish prejudice and the apartheid and Zionist nature of the Israeli state." PSC has stated that it's a "myth" that "Hamas is an illegal terrorist organisation bent on Israel's destruction." Rather, "Hamas is a nationalist, Islamist organisation consisting of political party, with a military wing, which for years was largely responsible for running hospitals and schools in Gaza, in a situation of military occupation." Maha Rahwanji, a PSC executive committee member, joined several other PSC members in signing a petition to remove "Hamas and all other Palestinian liberation organizations from the European list of proscribed terrorist organizations" in March, 2009. The petition further asked candidates for the 2009 European Parliament to recognize "Hamas as a legitimate voice for the Palestinian people's aspirations for national liberation." In November, Viva Palestina UK held a fundraising event in conjunction with Interpal, a group designated by the U.S. Treasury in 2003 as a charity front for Hamas. In 2006, Galloway raised more than £300,000 for Interpal. For the third convoy, Viva Palestina also partnered with the IHH Charity in Turkey, and has received donations from fundraisers held by Former Malaysian Prime Minister Mahathir Mohamed's Perdana Peace Foundation. Mohamed recently alleged that the 9/11 attacks included a "controlled demolition" by the "Jewish owner" of the third World Trade Center building that collapsed. Galloway also spoke with Mahathir at the October "Conference to Criminalize War." In sum, while denying allegations it supports Hamas, Viva Palestina has directly given money to Hamas officials, teamed up with an NGO tied to a designated Hamas support entity, and raised money with a UK charity similarly designated. It may have toned down its rhetoric, but questions about the true use of Viva Palestina money remain unanswered. Who else can help the palestinians. In the name of humanity, people of the world must assist the palestinians to get their land back. After years of oppression by the terrorist state of israel.